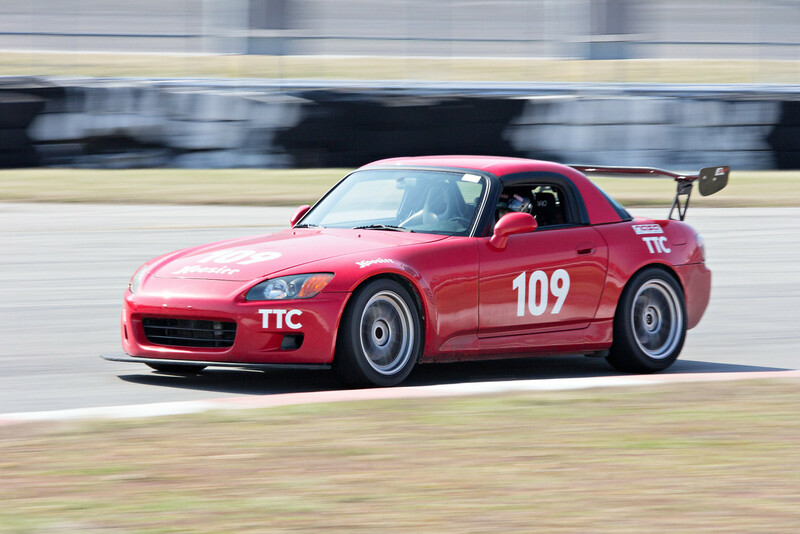 The S2000 returned to the track this weekend in full form, running in the crossover event between the NASA Central and Midwest regions at Gateway International Raceway. I was able to secure the class win on both days with a 1:10.518 best lap on Saturday and a 1:10.719 on Sunday. Saturday's time, while short of my personal best and NASA Midwest record of 1:09.729, did take over the top spot in the Central record books for the TTC class. Since the last time it hit the track, the S2000 has had the engine replaced (with another stock unit), the exhaust replaced, the catalytic converted removed, and the splitter added. As a compromise to the added power and downforce, I was also required to add weight this year, taking the competition weight up from 2815 to 2880 lbs. Given the slower than personal best times, the jury is still out on whether the shift in setup has been an improvement. I'll have to get back into the swing of things as a driver before I can fully judge the trade-off, that small margin of difference in the first event could certainly be attributed to being out of practice! On the non-performance side of the equation, the S2000 saw the installation of a 6 point harness, high density roll bar padding, and a head and neck restraint system from Necksgen to try and make things a bit safer in an emergency. The car is still driven on the street to and from all the events, so I was a bit reluctant to remove the stock 3 point belt, but the data for a HNR is pretty convincing and the videos even more so. The new system obviously makes it take a lot longer to get into the car, and I further have to remember to set up everything (data, video, windows) before strapping in, but I definitely had better peace of mind out on the track. Given the amount of changes that had been made to the car, I was very happy with the performance. I have some more work to do to iron out some of the details and find the next few tenths of time, but I'm looking forward to the next NASA Midwest event at Autobahn Country Club! Special thanks to the The Winning Formula for helping to get the car back to full health and Izzy's Custom Cages for getting the car inspected and making the awesome trophies (pictured above) that were handed out this weekend! Also congratulations to my friend Nick Wexberg who was signed off for his Time Trial license this weekend and secured 2nd place in TTB both days with some great times in his NSX. With two months to go until Nationals at Mid Ohio, the July Great Lakes event was PACKED. We had what must have been a record 57 TT cars putting in times and the traffic on the track reflected it. I came to the track with the same setup and tires as Grattan and was hoping to chase down both the regional TTC record of 1:41.974 and the National record of 1:38.723. However, due to (insert long list of excuses here), I wasn't up to the challenge. Nevertheless, I took home a solid 2nd place finish in a field of 8 TTC cars, behind Aaron Leichty in the #190 S2000 both days. This scored a pair of new tires and extended my lead in the Great Lakes season championship. Well I'm finally taking some time to catch up on the website. August at Mid Ohio was another sold out event with everyone preparing for Nationals the following. I again managed to take second place both days, in a field of 12 on Saturday and 11 on Sunday. With the packed field, it was tough to find open track (a hint of things to come), but I managed almost identical best times of about 1:38.6 both days. This put me about half a second off the lead, setting me up well for the National competition.